We asked experts in the pool service business to share their biggest learnings from running a business and attending the Western Pool and Spa Show. We spent March 21-23, 2019 in Long Beach, California at the Western Pool and Spa Show. It’s is one of the largest pool service industry trade shows of the year—with a schedule filled with classes for everyone from the beginner single poler to the advanced pro. Add to that an expansive exhibit floor and the show is three busy days of learning tips and tricks, getting up close demos of new tools, and of course, meeting other people in your field. While at WPSS, we asked a few attendees for their biggest takeaways—and we have a few of our own as well. Want more tips from pool experts for starting a pool cleaning business? We asked and they shared some of the best tips for starting in the pool service industry. Improve job completion rates and boost your customer service. Learn how Jobber can help you with client communications. 9. When all else fails, a great software like Jobber can help. Nathan White, Repair Manager at Patriot Pool and Spa shares how having the ability to get information from his team in the field can help him answer calls no matter where he is. Nathan uses Jobber and it helps him provide industry leading customer service. “Techs on site take pictures, take notes, and put them in jobs. So, if a customer calls in and asks me a question, I can actually pull up a job, see a picture of it, understand exactly what they are talking about, and easily give them directions. I’ll say, ‘pull that yellow lever,’ and they’ll be like, ‘where are you? !’ I’m actually looking at it from the office, and we can get it fixed.”. How did this business owner become one of the largest single location pool service providers in America? Missed this year’s show and hoping to grab a few learnings? Don’t worry, we’ve got you covered! 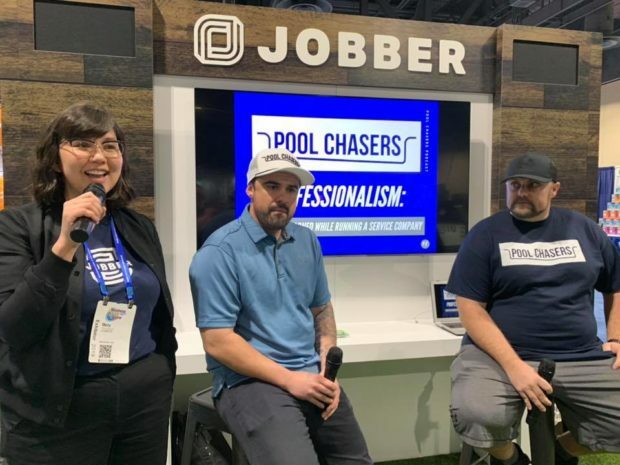 At the Western Pool and Spa Show, we also hosted two panels with Greg and Tyler of the Pool Chasers. If you missed them, you can still watch our recordings on Professionalism: What We Learned While Running A Service Company and Company Culture: Appealing To A New Generation on our Facebook Page. Share advice with other entrepreneurs who get what you're building.